In the beginning, creatures said to writers, "Tell our story." 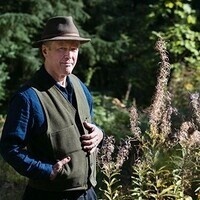 In his talk Earth Verse: Writing for the Good Earth, Kim Stafford, Oregon's current poet laureate, will explore how we can tell stories though Earth verse. Spells, charms, poems, psalms, and songs have long provided solace, clarity, and a chance to make peace with ourselves, each other, and the Earth. Through poems, Stafford says, trees teach and rivers guide. Stafford is the author of a dozen books of poetry and prose and is the founding director of the Northwest Writing Institute at Lewis & Clark College, where he has taught since 1979. He has received creative writing fellowships from the National Endowment for the Arts, a Governor’s Arts Award, and the Stewart Holbrook Award from Literary Arts for his contributions to Oregon’s literary culture. His books include 100 Tricks Every Boy Can Do, The Muses Among Us, Wind on the Waves: Stories from the Oregon Coast, A Gypsy's History of the World, and Wild Honey, Tough Salt. "Poetry is our native language,” says Stafford. “We begin with imaginative experiments as children, and lyric language can be a realm of discovery and delight throughout life. For adults and communities, poetry can help us be more open to new ideas, emotionally informed, and buoyant in responding to challenges. In a society of diverse backgrounds and perspectives, poetry builds community." This event is free and open to everyone. Sponsors include the Spring Creek Project, OSU Press, and OSU's School of Writing, Literature and Film. Grass Roots Books & Music will have several of Stafford's books available for purchase.